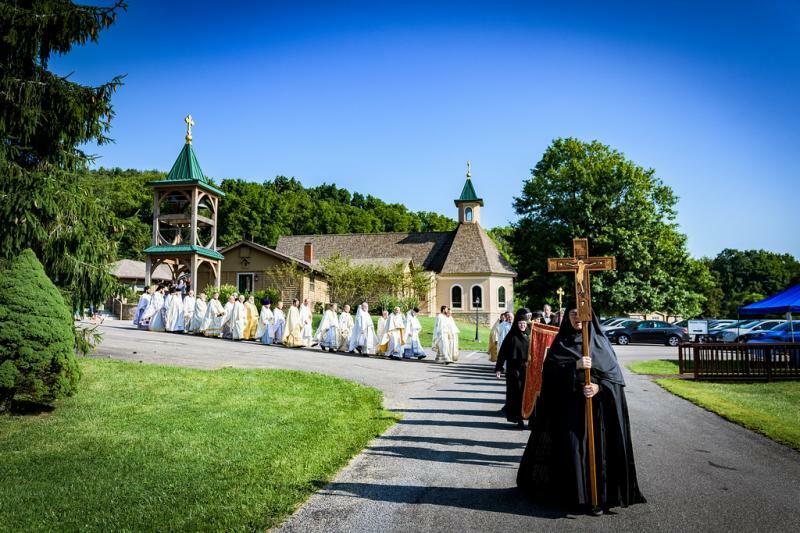 The pilgrimage—which marked the 50th Anniversary of the monastery’s founding by the late Mother Alexandra, the former Princess Ileana of Romania—opened on Saturday, August 4, with the celebration of the Vigil for the Prefeast of the Transfiguration. On Sunday evening, His Beatitude, Metropolitan Tikhon, officiated at the festal Vigil. Monday, August 6—the Great Feast of the Transfiguration—opened with the celebration of the Akathistos Hymn “Glory to God for All Things,” after which 40 vested priests were led in procession by the nuns to the outdoor chapel, where the Hierarchical Divine Liturgy was celebrated. 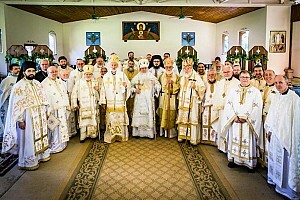 After greeting the visiting hierarchs at the monastery’s newly constructed guesthouse, Tabor House, the nuns led them in procession to the chapel, where Mother Abbess Christophora formally welcomed Metropolitan Tikhon. Mother Christophora concluded her remarks by thanking the sisterhood for their very earnest, dedicated and dependable service to the monastery, without which “nothing would be here—neither buildings, nor liturgical services, nor hospitality—without their labors.” Following the festal services, hundreds of pilgrims enjoyed a complimentary catered luncheon and spent time in the monastery gift shop, where copies Mother Alexandra’s autobiography, I Live Again, were available.